The years leading up to 1950 spawned a revolution in the design of single-deck buses and coaches, in which, in an effort to increase passenger capacity, the engine was removed from its traditional prominent position "between the shafts", turned on its side, and tucked away ignominiously under the floor. Leyland had built a class of buses to this design for London Transport before the war, and BMMO standardised on it from 1946 for their Midland Red fleet. Coincidentally, when Sentinel started building diesel lorries in 1946, they mounted the engine horizontally under the cab floor, just as they had done with their famous steam waggons. This experience, together with with the fact that the company was by then part of a group which also made panelling for Beadle bus bodies, placed Sentinel in an ideal position to take part in the underfloor-engined bus revolution. 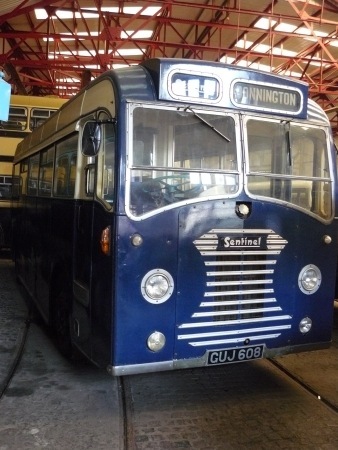 In fact Sentinel was the first manufacturer to offer such a bus on the open market, exhibiting two complete vehicles at the 1948 Commercial Motor Show, while Leyland – who were developing the Olympic – could only show a horizontal engine as a taster. 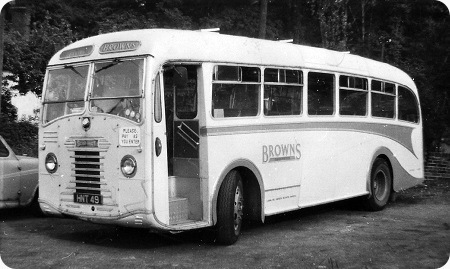 The first models were the STC4, a lightweight integral product with bus bodywork built by Sentinel to Beadle design, and the SLC4, which was supplied as a chassis for outside bodying as bus or coach, although most were bodied by Beadle as coaches. Six-cylinder models STC6 and SLC6 followed after a couple of years, the latter with a wider choice of bodywork. Unfortunately Sentinel’s reputation in the bus world began as non-existent, started to sink because of early problems with engines and engine mountings, and never really recovered. The company gave up building road vehicles in 1956. With the exception of Ribble, who were involved in the design process and purchased a total of 20 Sentinels, most buyers were small independents, of which Browns of Donnington Wood in Shropshire was one of the best known. The STC4 shown here was new as a Sentinel demonstrator, and the SLC4 had been converted by the operator from a centre-entrance coach to a front-entrance omo bus by the time these photos were taken in 1968. Both vehicles are still in existence. "Following GUJ 608’s photo from Peter Williamson, in Brown’s colours. Here’s a photo I took of her yesterday (6th Nov 2011) at the Aston Manor Museum, Birmingham. The museum officially closed on 30th Oct, but they helpfully let me in. I couldn’t discover whose livery it was painted in, but maybe it was the one it wore whilst a demonstrator, bearing in mind it shows Senitinel in the number box. Its history, prior to Brown’s ownership, was demonstrator, then Maryland Coaches, East London, for four years, then Warners of Tewkesbury, for four years. The future of the museum’s collection is now uncertain, as they must vacate the building by 31st Dec.."
GUJ 608 is currently in the livery it wore as a Sentinel demonstrator at the beginning of its life, although it is believed that it kept this colour scheme while with Maryland Coaches. Warners repainted it in their two-tone green livery. en route Whiston. Could this be one of the two actual buses. They also produced buses for a firm called Camplejohn. Hope this is of some interest ! The destination is Donnington, suggesting that it still has a Browns blind. As far as I can ascertain, the only Sentinel that ran for Wigmores of Dinnington was JWW 316. Apparently a second one (unidentified) was exhibited in Wigmores livery at the 1950 Commercial Motor Show, but was never delivered. 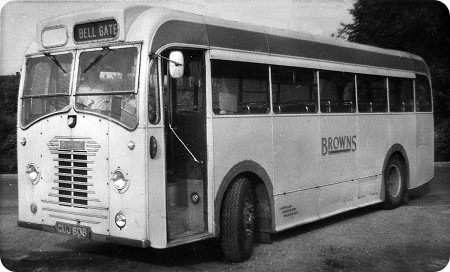 The original livery was cream/green and it was Donnington, this bus was part a fleet of Sentinels that belonged to H. Brown and Sons, H. Brown being Harry Brown who was my late great grandfather, look at Made in Shrewsbury for history of the Sentinels. Does anyone know where this bus is now? The past year has been a torrid time for Aston Manor Museum staff, first moving to what they thought was a secure site, then having to move again. Transferring, by road, some frail items, like part-trams and other barely roadworthy vehicles, proved difficult. They are still near their original site, however and, I assume, GUJ 608 is still with them. They hope to re-open around Easter. There is an earlier reference to Camplejohn Bros. This company operated in the Barnsley area before being acquired Yorkshire Traction. Re the above link to pics of Camplejohn vehicles, the TTC 882 depicted was, as can be seen but not expressly stated, an Atkinson Alpha. All the other vehicles shown were Sentinels – apart from the obvious Dennis Lancet, of course. Stumbled across the picture of the blue Sentinel. I remember the first of these being operated by A C Wigmore (1949) on their Dinnington to Sheffield service. They seemed so modern and advanced when compared to the cab single deck Leylands, operated by East Midlands. As a small boy, I would always watch for this new bus and I remember keeping a blue chalk drawn sketch of it on the inside of my school desk, all through the year. How I wished to drive one! I’ve recently had a visit to the new AMRTM site and my report is at www.focustransport.org.uk/ Due to the building’s smaller size many of their vehicles are being stored off site, and I am assuming this is also the case of the Sentinel which is not at the new site. AMRTM now have a facebook page to keep people up to date about their collection. The AMRTM Sentinel belongs to Richard Gray who is a Director. It is I believe at their off site storage and not on display. It is good to see the old sentinels again that I used to drive on the service route Donnington to Oakengates and also help maintain them. They were great years and I believe Browns were the first to introduce one man operated vehicles and later were one of or maybe the first who introduced exact fair payment on entrance. I used to drive both of the above with HNT 49 being the faster of the two able to do some 45 mph. When I was in the RAF at Patrington, East Yorkshire in 1955/6 we often travelled on the buses and coaches of Connor and Graham of Easington, Spurn Point. The small firm had a most interesting and varied fleet, one of which was a Sentinel JWF 176, acquired new. My memories of it are of a comfortable and, for the time, spritely vehicle. On occasions it would operate the 2300 hours on Sunday evenings from Leeds Bridge Street back to our Camp. I’ll never forget the time when JWF 176 arrived, driven by a disgruntled chap called "Jock" who didn’t know the meaning of the phrase "vehicle sympathy." In the early hours of Monday morning as we sped downhill past the race course into sleepy Beverley the exhaust silencer blew open – without even reducing velocity one iota Jock sped on towards the even sleepier Holderness – I wouldn’t be surprised if all the good residents of the many villages en route scrambled for their WW2 gas masks and tin shelters, under the impression that the War was not over after all. The RAF Police sergeant in the guardroom, and his Alsatian, were overcome with shock………… and the epic journey passed into history !! The Aston Manor bus museum has transferred to Northgate, Aldridge, Walsall and is open several times per week. When I went to Ribble in 1972, Harry Tennant had been Chief Engineer since 1947. He told me that Sentinel’s were used on service around Leyland deliberately to spur Leyland Motors into faster development of an underfloor engined single deck. Throughout his reign, on behalf of Ribble he was often leading vehicle developments. Samples: Gay Hostess, White Ladies, VRL Coaches, reverting from Atlantean to PD3 with full fronts (so driver could have similar supervision of forward door), installation of the first 680 engine in a Leyland National (to prod Leyland to get rid of the fixed-head 510) and the construction of the battery electric Leyland National (complete with battery trailer) on behalf of NBC. My father and grandfather were the owners of Maryland Coaches. The sales rep tried to sell the Sentinel to my father he refused telling him it’s not a coach it’s a bus. He was running a fleet of Leyland, Bedfords and AEC coaches. The rep then found my grandfather in the local pub and talked him to signing up for the Sentinel. My father was not very happy with my grandfather. After running the Sentinel for some years they could never get over brake problems then selling GUJ 608. I talked to the owner in 1993/4 told me still had no brakes. The colour was the delivery colour. Hello to you all particularly Phil Brown and John Millington ……. Great to see all this going on , which brings back wonderful memories of my days at H. Brown and Sons, which was run and managed by my late Stepfather Alfred Richard Brown youngest son of Harry. There were other sons of Harry who also assisted in the running of H. Brown and Sons. I worked in the office and in 1972 ( I was 21 ) I passed my PSV …. second woman in the UK (first being in London apparently ) but I never got to drive the Sentinels as my Stepfather thought they were too heavy for me to handle, although I did pass my PSV with a 45 seater Duple with no power steering. H. Brown and Sons were the best days of my life and I was so sorry to be made redundant when my Stepfather decided to sell out in 1978 as he and the remaining family members were all getting older and the need to retire became more essential ! Marvellous times , fantastic staff and absolutely tip top maintained coaches and buses by Uncle Sid Brown, his son Chris, John Millington and Russell Ashley. I’m Currently working on a Sentinal coach the reg no is AUX 296, we are looking for a Hercules engine as the current one has many parts missing & has Seized. can anyone help, any advise would be most helpful.